Can multivitamins really make your acne worse? Believe it or not, your multivitamin might be doing more harm than good when it comes to your skin. While the debate has been out for a while now about whether or not multivitamins actually work, it’s no secret that many of the most popular multivitamins sold today are loaded with certain vitamins and minerals that can cause acne. On top of that, many multivitamins contain very small amounts of vitamins and minerals that fight acne. There’s plenty of reasons your skin might clear up after cutting out your multivitamin or switching to skin-friendly supplements. Should you take a multivitamin if you have acne? Believe it or not, you can have too much of a good thing. Multivitamins often contain high amounts of nutrients that, in excess, can cause acne. This includes vitamin B12, biotin, and calcium. In addition to having too many acne-causing vitamins and minerals, multivitamins typically also contain synthetic/artificial forms of essential nutrients for clear skin, including vitamin A, vitamin B9, and vitamin C.
Long story short, multivitamins contain too much of the wrong stuff (nutrients that in excess cause acne) and not enough of the right stuff (nutrients that prevent acne). Vitamin B12 promotes inflammation-causing compounds found in acne, which can contribute to inflammatory acne1https://www.ncbi.nlm.nih.gov/pmc/articles/PMC6049814/. This inflammation can take a relatively harmless acne infection and turn it into a bright, red, protruding pimple. 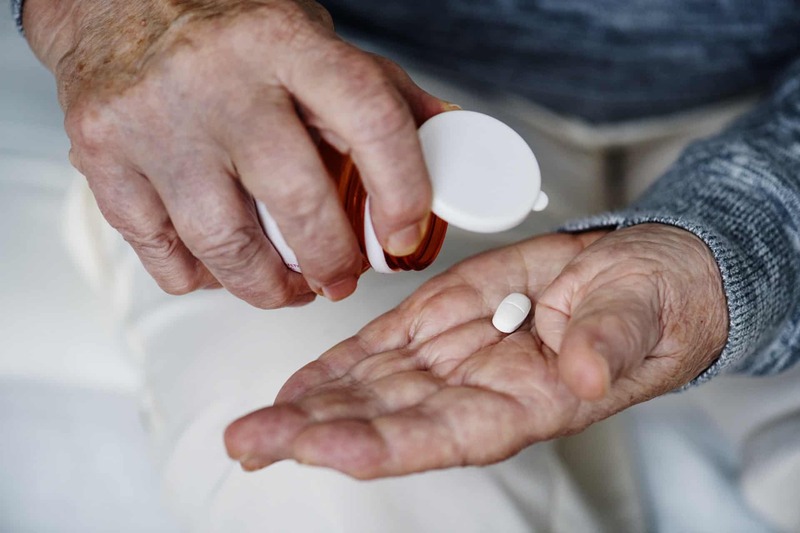 One study found that vitamin B12 altered the gene expression of the skin, making it more prone to inflammation2https://www.ncbi.nlm.nih.gov/pmc/articles/PMC6049814/. Nearly all men’s and women’s multivitamins (food-based and artificial) contain insane amounts of vitamin B12. The daily recommended intake of vitamin B12 is somewhere around 2.4mcg per day. Your typical multivitamin has upwards of 5, 10, or even 20 times that amount. This extreme intake of vitamin B12 through multivitamins could cause worsen existing acne and trigger the inflammation that makes pimples. Biotin plays an important role in the health of your skin, nail, and hair. In fact, biotin deficiency can lead to hair thinning, brittle nails, and itchy skin. Just like vitamin B12, the problem isn’t biotin, the problem is too much biotin. You need both biotin and pantothenic acid for healthy skin. Problems arise when you have too much biotin and not enough vitamin B5. Your body absorbs pantothenic acid and biotin using the same receptors. Basically, biotin and pantothenic acid compete with each other. If you have too much biotin, it’ll be difficult for your body to absorb any pantothenic acid, which can lead to dry, acne-prone skin. Most multivitamins contain anywhere from 100-3,000% of the daily recommended intake of biotin, especially if the multivitamin is marketed towards women. Isn’t calcium good for you? Doesn’t it help make your bones strong? Well, not quite. Calcium may impair the body’s ability to absorb zinc. Zinc is one of the most critical nutrients for clear skin. It helps regulate the skin-shedding process, decrease inflammatory acne, and transport vitamin A throughout the body. One study found that after 12 weeks of treatment with zinc, the mean acne score fell from 100% to 15%3https://jamanetwork.com/journals/jamadermatology/article-abstract/536705. High calcium content is one of the reasons to stay away from dairy for clear skin. Again, the problem isn’t calcium, but too much calcium. If you’re eating a dairy-heavy or calcium-rich diet, you may want to avoid multivitamins that add even more calcium to your diet. Not only do vitamins contain too much of the wrong stuff, but they contain very few bioavailable skin-clearing nutrients. For instance, many vitamins contain high amounts vitamin A in the form of beta carotene, a form of vitamin A that is extremely inefficient for the body to use. Other vitamins may be high in certain B-vitamins vitamin C, or vitamin E, but not the right type. Most vitamins contain folic acid or ascorbic acid, which are forms of vitamin B and vitamin C that aren’t easily converted into usable nutrients. Unless it’s a real, whole food-based multivitamin (which are still usually high in vitamin B12, biotin, and calcium), odds are you’re just flushing money down the drain by buying multivitamins for your skin. Still, there are some supplements that may be necessary for clear skin. Rather than taking a single multivitamin for healing acne, I recommend supplementing with specific, high-quality, bio-available forms of a handful of the most important acne-fighting nutrients. Whenever possible, I recommend getting your nutrients through whole-food sources. As you’ll see here, most the of the supplements I recommend are derived from food. If you’re eating a diet that triggers the root causes of acne, the supplements you take aren’t going to matter much in the long-run. 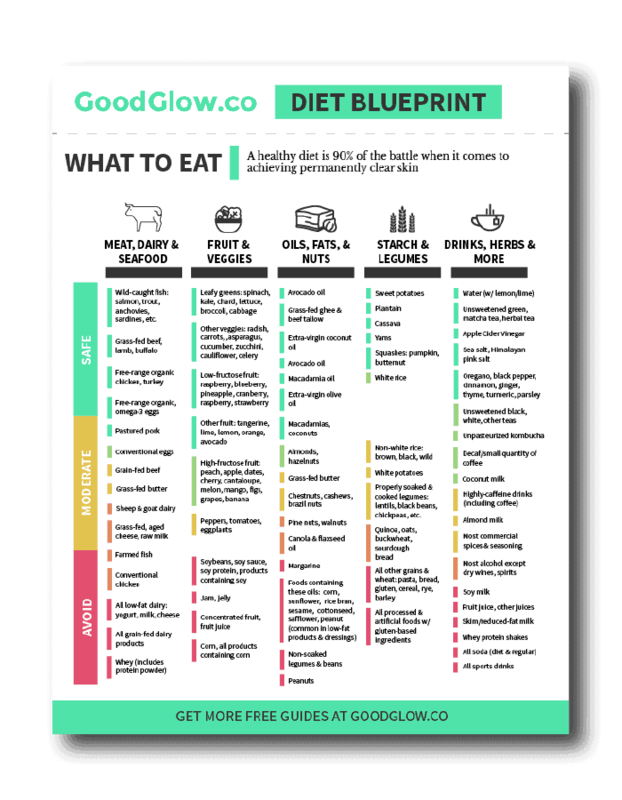 If you’re looking for a good starting place when it comes to diet and acne, the GoodGlow Diet Blueprint is a great first step. It has everything you need to start eating an acne-free diet, all on one page. After you cleaned up your diet, there are a few supplements that most people can benefit from. Again, if you’re eating a diverse range of foods, including organ meats and seafood, and not a whole lot of antinutrient-rich foods (grains, legumes, dairy), you may not need these supplements. For the rest of us, they can be powerful tools for clear skin. For more information on supplements, see my full guide to Supplements for Clear Skin here. Zinc is such an important nutrient for acne that I wrote an entire Guide to Zinc for Clear Skin. Zinc is clearly a critical component of clear skin, but it’s extremely difficult to get through our diet. Oysters, lamb, beef, and shrimp are a few of the only reliable source of zinc. On top of that, eating grains, legumes, or even dairy might drastically limit your body’s ability to absorb zinc4https://www.ncbi.nlm.nih.gov/pubmed/10801947. If you don’t eat much beef, lamb, turkey, shrimp, or oysters, or you eat large amounts of foods high in phytic acid, including grains (bread, pasta, rice, etc.) legumes, beans, spinach, chard, dark and chocolate, then I’d recommend supplementing with zinc. Zinc picolinate has been shown to be the most easily accessible form of zinc for the body. I take anywhere from 15mg to 60mg daily depending on my diet. 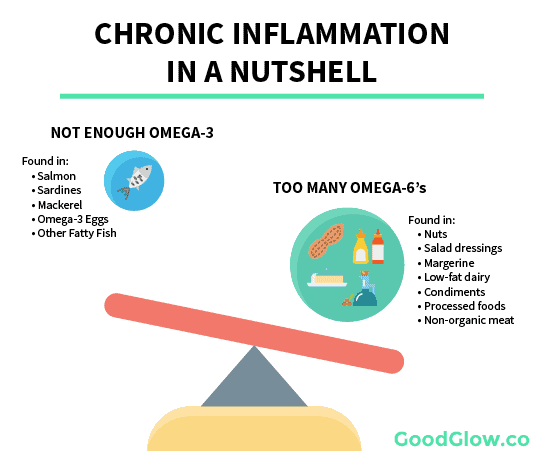 Eating too many inflammation-causing omega-6 fatty acids and not enough anti-inflammatory omega-3 fatty acids can throw off your body’s immune system. Your body ends up seeing every acne infection as a major threat and sends a typical inflammatory response – the area swells and becomes red. In other words, a pimple is formed. While most of us eat plenty of omega-6 fatty acids in the form of nuts, salad dressings, fried foods, and factory-farmed meat, we rarely get enough omega-3 fatty acids found in wild-caught fatty fish like salmon, sardines, and mackerel (note: farmed fish are extremely high in omega-6 fatty acids, so there’s no point in eating them for their anti-inflammatory effects). Unless you’re eating wild-caught fatty fish once or twice per week, you may want to consider taking an omega-3 supplement. This is especially true if you have protruding, red, inflamed pimples, not just acne. I recommend taking either a krill oil supplement or a high-quality, reputable, fresh fish oil supplement. Quality and freshness really matter when it comes to fish oil supplements because fish oil can easily go rancid and cause inflammation and acne. Krill oil is less likely to go rancid and more shelf-stable, but is more expensive and has less omega-3 than fish oil. Vitamin D is really a hormone, and it’s responsible for the expression of more than 1,000 genes. Every root cause of acne, from inflammation to insulin resistance, is touched in one way or another by vitamin D. One study found that 95% of people with acne were deficient in vitamin D6https://www.ncbi.nlm.nih.gov/pubmed/26413187. The ideal way to get enough vitamin D is through sun exposure, but for those of us who live in a colder climate or don’t have ample access to the outdoors may need to supplement with vitamin D.
Vitamin D3 is the body’s preferred form of vitamin D and the most bioavailable when it comes to supplements. Whenever you can, take vitamin D3 with a skin-safe, healthy fat, like coconut oil. Vitamin A is necessary for proper skin, eye, bone, and immune health. Vitamin A is extremely important for clear skin. Unfortunately, most of us aren’t getting enough usable vitamin A through our diet. Plants contain a form of vitamin A known as beta carotene and must be converted into retinol vitamin A in order to be used by the body. Only a fraction of vitamin A found in plants actually ends up being stored in the liver. On the flip side, vitamin A found in animals can be easily used by the body. Where can you find animal-based vitamin A? Pretty much only in liver. Beef, chicken, pork, lamb, and cod liver are all great sources of vitamin A. Either will work, I personally alternate between to the two, but for a lot of Americans clean, grass-fed liver isn’t readily available, so supplements are a must. Note: Liver is one of those cuts of meat that you’ll want to get grass-fed/organic. The quality of the liver can drastically alter the composition of the food. Magnesium is a lot like vitamin D. It affects a wide array of bodily functions, including several root causes of acne like insulin resistance, inflammation, sleep, and stress hormones. It’s also extremely difficult to get enough magnesium through food alone, which is why most Americans are deficient in it7https://www.ncbi.nlm.nih.gov/pubmed/12949381?dopt=AbstractPlus. Foods that used to be extremely rich in magnesium are much lower in modern times due to our farming practices. Even if you’re eating lots of magnesium-rich foods, like sunflower seeds, spearmint, and dark leafy greens, you may be deficient in magnesium. I use magnesium chloride, which comes in a spray and is easily absorbed by the body. We went over why multivitamins cause acne: they contain extremely high quantities of acne-causing nutrients like vitamin b12, biotin, and calcium. They’re also very low in bioavailable nutrients that can help fight acne. Next, we talked about a better strategy for getting the nutrients you need to achieve clear skin through specific supplements, including vitamin A, zinc, omega-3 fatty acids, vitamin D, and magnesium. Finally, I’d like to remind you that no supplement is going to be able to make up for an acne-causing diet. Getting your diet under control is the first and most important step towards clear skin. 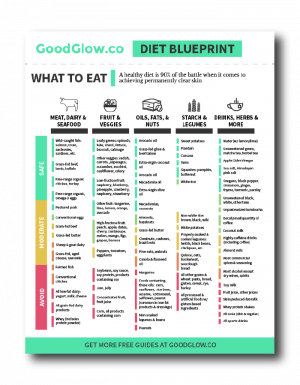 If you’re looking for a good starting place, check out the GoodGlow Diet Blueprint – it has everything you need on one page to start eating a diet optimized for clear skin. What supplements have you tried for clear skin? Have you seen any results? Let me know in the comments below!